The aim of this paper is to check if the models with realistic inhomogeneous matter distribution and without cosmological constant can explain the dimming of the supernovae in such a way that it can be interpreted as an acceleration of the Universe. Employing the simplest inhomogeneous model, i.e. Lemaître-Tolman model, this paper examines the impact of inhomogeneous matter distribution on light propagation. These analyses show that realistic matter fluctuations on small scales induce brightness fluctuations in the residual Hubble diagram of amplitude around 0.15 mag, and thus can mimic acceleration. However, it is different on large scales. All these brightness fluctuations decrease with distance and hence cannot explain the dimmining of supernovae for high redshift without without invoking the cosmological constant. This paper concludes that models with realistic matter distribution (i.e. where variation of the density contrast is similar to what is observed in the local Universe) cannot explain the observed dimming of supernovae without the cosmological constant. This paper examines the supernova observations in order to thoroughly estimate the influence of inhomogeneities on light propagation. Studies in this field proved that inhomogeneities can mimic the cosmological constant. However, this does not prove consistent with other astronomical observations. This paper provides some quantitative insight to matter fluctuations' influence in terms of the amplitude, δm, measured in the residual Hubble diagram. The observations of supernovae are a powerful tool in modern cosmology. Analyses of the supernova brightness provide us with a reliable estimation of their distance from an observer. For this estimation to be satisfactory, all factors which might influence the observed supernova luminosity must be taken into account. In literature five factors are examined; namely, evolution of supernovae, dust absorption, selective bias, gravitational lensing, and cosmological models. Except for the last one they do not seem to be responsible for observed 'dimming' (for details see Refs. [1–5]]). Analyses of supernovae in various homogeneous cosmological models imply a non-zero cosmological constant. However, similar analyses in inhomogeneous models have not been systematically studied. The luminosity distance of supernovae without the homogeneity assumption is to be analysed as well. The luminosity distance in inhomogeneous models might differ from the FLRW results. To examine this issue the Lemaître-Tolman model is employed. In this approach not only matter is inhomogeneously distributed but the expansion of the space in not uniform as well. Results in the form of the residual Hubble diagram provide us with the estimation of the impact of matter inhomogeneities. The effect of inhomogeneous matter distribution on supernova observations was studied by many authors. For example employing the Lemaître-Tolman model and the Taylor expansion of the luminosity distance in powers of the redshift Célérier  showed that the inhomogeneities can mimic the cosmological constant. Iguchi, Nakamura and Nakao  also used the Lemaître-Tolman model to show that it is possible to fit supernova data without the cosmological constant. Similar results were obtained in the Stephani model by Godłowski, Stelmach and Szydłowski . and in the Szafron model . Also models by Alnes, Amarzguioui and Gron  where the density is increasing with distance and models by Enqvist and Mattsson where expansion is decreasing with distance  successfully fit supernova data without a need for the cosmological constant. There have also been other models proposed, in particular Swiss cheese models by Mansouri  and Brouzakis, Tetradis and Tzavara [13, 14]. For a review on explanation of the acceleration expansion without the cosmological constant the reader is referred to Ref. . The effect of inhomogeneities was also studied with aid of approximate methods [16–18]. Recently Vanderveld, Flanagan and Wasserman  studied this issue using perturbation approach up to the second order in density fluctuations. Their results are similar to [16–18] and indicate that the effect of inhomogeneity on the expansion of the Universe is small and thus cannot explain the apparent acceleration. However, because of the perturbation framework their results are valid only for small values of density fluctuations. Since the real density fluctuations in our Universe largely exceed δ ~ 1 in order to draw reliable conclusion similar analyses should be conducted by employing exact solution of the Einstein equations. These studies have shown that matter inhomogeneities can explain the apparent acceleration of our Universe without employing the cosmological constant. This paper not only indicates that there are some specific conditions which enable explanation of the supernova dimming without but also examines the influences of the realistic matter distribution on light propagation. The structure of this paper is as follows: Sec. 2 presents the Lemaître-Tolman model; in Sec. 3 presents observational constraints; Sec. 4.1.1 presents the residual Hubble diagram for models with realistic density distribution but without the cosmological constant; Sec. 4.1.2 presents results of fitting models to the supernova measurements without the cosmological constant; Sec. 4.2 presents the residual Hubble diagram for models with the realistic density distribution and with the cosmological constant. where dΩ2 = dθ2 + sin2 θdφ2, and E(r) is an arbitrary function of r. Because of the signature (+, -, -, -), this function must obey E(r) ≥ - 1 2 MathType@MTEF@5@5@+=feaafiart1ev1aaatCvAUfKttLearuWrP9MDH5MBPbIqV92AaeXatLxBI9gBaebbnrfifHhDYfgasaacH8bkY=wiFfYlOipiY=Hhbbf9v8qqaqFr0xc9vqpe0di9q8qqpG0dHiVcFbIOFHK8Feei0lXdar=Jb9qqFfeaYRXxe9vr0=vr0=LqpWqaaeaabiGaaiaacaqabeaabeqacmaaaOqaaKqbaoaalaaabaGaeGymaedabaGaeGOmaidaaaaa@2D75@ . where M(r) is another arbitrary function and κ = 8 π G c 4 MathType@MTEF@5@5@+=feaafiart1ev1aaatCvAUfKttLearuWrP9MDH5MBPbIqV92AaeXatLxBI9gBaebbnrfifHhDYfgasaacH8bkY=wiFfYlOipiY=Hhbbf9v8qqaqFr0xc9vqpe0di9q8qqpG0dHiVcFbIOFHK8Feei0lXdar=Jb9qqFfeaYRXxe9vr0=vr0=LqpWqaaeaabiGaaiaacaqabeaabeqacmaaaOqaaGGaciab=P7aRjabg2da9KqbaoaalaaabaGaeGioaGJae8hWdaNaem4raCeabaGaem4yam2aaWbaaeqabaGaeGinaqdaaaaaaaa@3486@ . When R' = 0 and M' ≠ 0, the density becomes infinite. This happens at shell crossings. This is an additional singularity to the Big Bang that occurs at R = 0, M' ≠ 0. The shell crossing can be avoided by setting the initial conditions appropriately . where t B (r) appears as an integration constant, and is an arbitrary function of r. This means that unlike in the Friedmann models the Big Bang is not a single event, but it can occur at different times at different distances from the origin. Thus, the evolution of the Lemaître-Tolman model is determined by three arbitrary functions: E(r), M(r), and t B (r). The metric and all the formulae are covariant under arbitrary coordinate transformations of the form r = f(r'). Using such a transformation, one of the functions determining the Lemaître-Tolman model can be given a desired form. Therefore, the physical initial data of the Lemaître-Tolman model evolution consists of two arbitrary functions (see Ref. on how to specify the Lemiaître-Tolman model). The above ambiguity in the definitions of the Hubble constant shows that one should be very careful in measuring the parameter which is called the Hubble constant. For example the value of the Hubble constant derived from the continuity equation: H c = -(1/3)( ρ ˙ MathType@MTEF@5@5@+=feaafiart1ev1aaatCvAUfKttLearuWrP9MDH5MBPbIqV92AaeXatLxBI9gBaebbnrfifHhDYfgasaacH8bkY=wiFfYlOipiY=Hhbbf9v8qqaqFr0xc9vqpe0di9q8qqpG0dHiVcFbIOFHK8Feei0lXdar=Jb9qqFfeaYRXxe9vr0=vr0=LqpWqaaeaabiGaaiaacaqabeaabeqacmaaaOqaaGGaciqb=f8aYzaacaaaaa@2CC5@ /ρ) (where ρ is density) is in general not equal to the Hubble constant derived from the measurements of the Hubble flow: H f = V/D (where V is the receding velocity, D distance). In this paper when referring to the Hubble parameter it is assumed that the Hubble parameter is defined by eq. (5). Please note that at origin because of the regularity condition R → ra and H coincides with H0. k α ;βk β = 0.
where subscripts e and o refers to instants of emission and observations respectively. Models considered in this paper were defined by functions presented in Table 1. The radial coordinate was chosen as a present day value of the areal radius, i.e. r := R0. In the case when model is defined by a pair t B and ρ, M(r) is calculated from eq. (2) then the function E(r) is calculated from eq. (4). In the case when model is defined by a pair H(r) and ρ, M(r) is calculated from eq. (2), then R ˙ MathType@MTEF@5@5@+=feaafiart1ev1aaatCvAUfKttLearuWrP9MDH5MBPbIqV92AaeXatLxBI9gBaebbnrfifHhDYfgasaacH8bkY=wiFfYlOipiY=Hhbbf9v8qqaqFr0xc9vqpe0di9q8qqpG0dHiVcFbIOFHK8Feei0lXdar=Jb9qqFfeaYRXxe9vr0=vr0=LqpWqaaeaabiGaaiaacaqabeaabeqacmaaaOqaaiqbdkfaszaacaaaaa@2C2B@ is calculated from eq. (5), and finally eq. (3) is used to calculate E(r). D L (t(r), r) = R(t(r), r)(1 + z)2. The astronomical observations providing us with information about the local Universe prove that matter distribution and expansion of the space are not homogeneous. The measurement of the matter distribution implies that the density contrast (δ = ρ/ρ b - 1) varies from δ ≈ -1 in voids  to d equal to several tens in clusters . These structures are of diameters varying from several Mpc up to several tens of Mpc. However, if averaging is considered on large scales, the density varies from 0.3ρ b to 4.4ρ b [30, 31] and the structure sizes are of several tens of Mpc. So far there is no observational evidence that structures larger than supercluster, i.e. of diameters of hundreds of Mpc or larger exist in the Universe. The measurements of the Hubble constant provide us with different values of H0 – from 61 ± 3 (random) ± 18 (systematic) km s-1 Mpc-1 , to H0 = 77 ± 4 ± 7 km s-1 Mpc-1 . However, due to very large observational and systematical errors (larger than 10%) it is impossible to observe any variations of the Hubble constant. This paper assumes that any realistic model must remain consistent with the above astronomical data. Namely, in models with the Hubble parameter as a variable we expect these variations to stay within the range indicated by the above observations. Analogously, in models with an inhomogeneous density distribution, we expect the density fluctuations to remain within the range indicated by the observations. where m emp is an expected magnitude in an empty RW model. and the Hubble constant H0 = 65 km s-1 Mpc-1. This section examines if the observed dimming of the supernova brightness may be caused merely by the matter inhomogeneities, without employing the cosmological constant. To do so the cosmological constant is set to zero and presureless matter is assumed to be the only component of the Universe. Astronomical observations of the local Universe indicate that its density varies from low values in voids to high values in clusters. Models 1, 2 and 3 are rough estimates of this phenomenon. In model 1 the majority of regions through which supernova light propagates are of low density. In model 2 most regions' density is higher than the background density. Model 3 has a cosine variation of density and its average density is of the background value. The exact form of these fluctuations is presented in Table 1. Alhtough the density distribution in above models is spherically symmetric and the real matter distribution in the Universe is not, such estimation is adequate if the time of the light propagation is small. For larger periods of time the evolution of matter becomes important. However since redshift z ≈ 0.5 the Universe did not evolve significantly, so up to redshifts z ≈ 0.5 the analysis presented here should not differ significantly form reality. 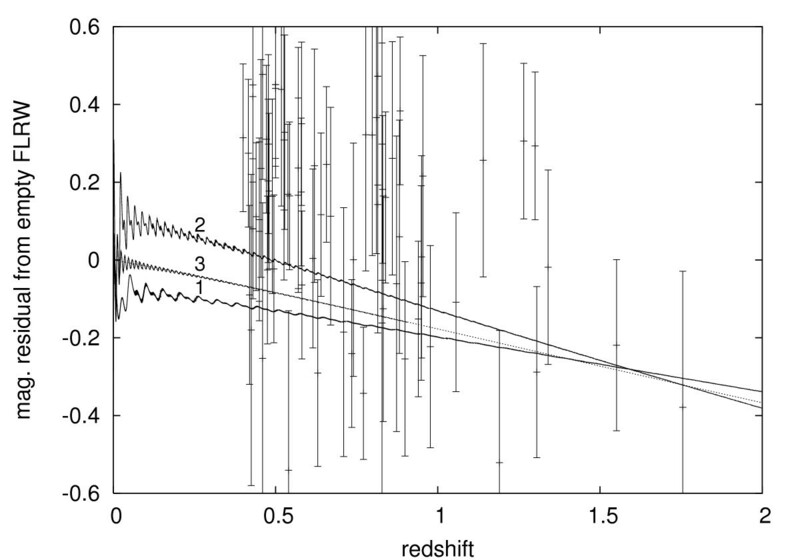 For higher redshifts we may expect larger differences between the results of these models and the real picture. Despite these differences, such analysis is important because it provides us with estimation of the influence of light propagation effects on the final results of supernova observations. Current density distributions are equal to these shown in Fig. 1. Note that this graph only represents density up to 200 Mpc to demonstrate a periodic character of assumed density distributions. As mentioned in Sec. 2 to specify the Lemaître-Tolman model two initial conditions have to be known. The first initial condition is the density distribution. The second initial data in this section is the distribution of the bang time function. It is assumed that t B (r) = 0. This assumption follows from the Cosmic Microwave Background (CMB) observations. These observations imply that the Universe was very homogeneous at the last scattering moment and as a consequence the amplitude of the bang time function could not be larger than a few thousand years, which in comparison with the present age of the Universe is negligible. If the t B were of larger value the temperature fluctuations would be greater than it is observed in the CMB sky . Using the algorithm from Sec. 2 the luminosity distance was calculated for the three above mentioned models. The results are presented in the form of the residual Hubble diagram in Fig. 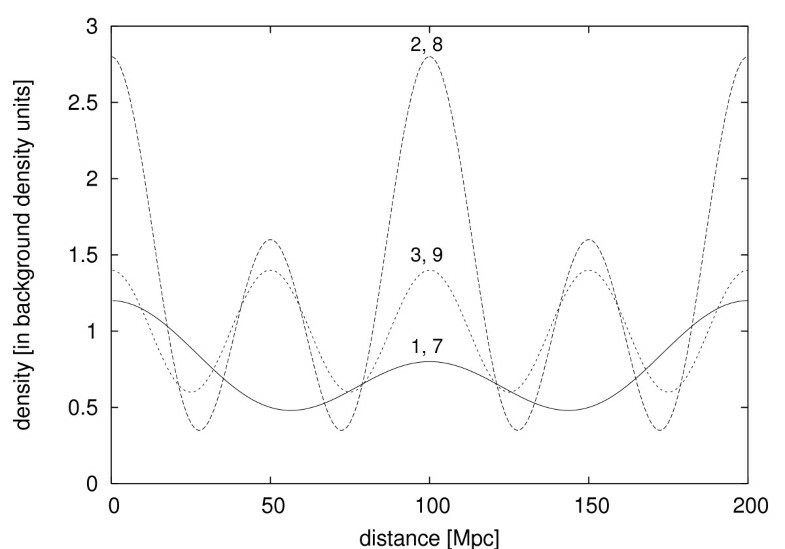 2 and indicate that realistic density fluctuations can mimic the acceleration on small scales. Firstly, in the residual diagram there are some regions where m is positive. Secondly, in some regions the luminosity distance increases faster than in the FLRW models. However, on large scales, a tendency for curves to decrease remains unchanged. Near the origin the fluctuations in residual diagram are large and are approximately equal to 0.15 mag, but they are decreasing with distance. Fig. 2 also depicts the curve for the homogeneous Ω mat = 0.27, ΩΛ = 0 model which, however, is not clearly visible due to very tight fluctuations of model 3 around it. Curve 2 presented in Fig. 2 lies above the curve of the the homogeneous hyperbolic model because in this model the expansion of the space is smaller than the expansion of the homogeneous Universe. This is because in this model the density of regions through which light propagates is larger than the background density. 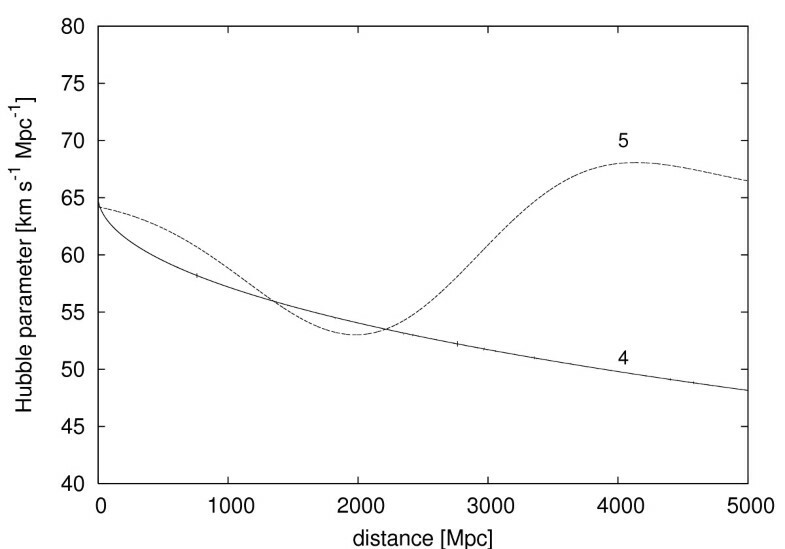 In model 1, a vast majority of the region is of lower density, hence, curve 1 is below the curve representing the hyperbolic homogeneous Universe. As one can see, if Λ = 0, the realistic density fluctuations alone cannot be responsible for the observed dimming of the supernova brightness. It has been proved that the Lemaître-Tolman model may be fitted to any set of observational data . Thus, the Lemaître-Tolman model can always be fitted to supernova data, without employing a cosmological constant. Nevertheless, if such a fitted model is in consistent with all the astronomical data (such as galaxy redshift surveys, CMB), then the problem remains unresolved. This section addresses the above mentioned problems. To specify a Lemaître-Tolman model one needs to know two initial functions. The functions such as E(r) or M(r) are difficult to extract from observations. However, the observations provide us with the measurements of ρ, H0 and t B . In this section these functions are chosen to enable one of them to be consistent with the astronomical observations, while the second function remains in accordance with the supernova observations as much as possible. In model 4 the bang time function t B (r) = 0 is consistent with the CMB observations. The density distribution is chosen so that it fits the supernova observations. The results are presented in Fig. 3. The values of χ2 test are presented in Table 2. The density distribution in model 4 monotonically increases; from an average value (ρ = ρ b ) at the origin to a value of ρ = 2.5ρ b at the distance of 3 Gpc. The increase of density yields a decrease of the expansion. Fig. 4. presents the Hubble parameter (as defined by eq. (5)). If local density and Hubble flow measurements extend up to the distance of Gpc then it might be supposed that model 4 is unrealistic. However, there are no systematic observations of the density distribution or expansion at distances of Gpc and all that is really known is that the relative motion of our Galaxy with respect to the CMB is small. This implies that to explain the relatively small motion with respect to the CMB rest frame the expansion of the Universe should increase at a larger distace. As can be seen the Lemaître-Tolman model is of a great flexibility so one can always choose such functions which would fit the CMB (the diameter distance to the surface of the last scattering is approximately 14 Gpc). This, however, requires futher complications of such a model. In model 5 the density distribution is assumed to be equal to the background value ρ = ρ b . This implies that no Gpc-scale structures exist in it. The second function which defines the Lemaître-Tolman model is the Hubble parameter which is chosen to fit the supernova observations. The variations of the Hubble parameter are presented in Fig. 4. As can be seen in Fig. 4 the variations of the Hubble parameter are comparable within 3σ estimation of the Hubble constant. However, such a behaviour is rather unrealistic, and together with model 4 suggests the existence of very large scale structures (of several Gpc diameters). Furthermore, in model 5 the bang time function is very inhomogeneous and decreases to almost -1.7 billions years at distance of 2.4. Such a large amplitude of t B is strongly inconsistent with CMB observations. In this model the Hubble parameter is chosen to be of 65 km s-1Mpc-1. The density and t B (r) are chosen to fit the supernova data. However, none of the attempts to obtain a satisfactory fit to the observational data succeeded. The best fitted model within the family of constant H models is the empty FLRW model (with Δm = 0). The above results suggest that the only way to fit the supernova data is to set the expansion of the Universe to be decreasing on the past null-cone. This can be done either be setting the expansion of the Universe to be decreasing with radial coordinate (models 4 and 5) or to assume the existence of cosmological constant (standard approach). The first alternative implies that the cosmological constant is not needed but our position in the Universe is very special and that on the scales of Gpc there exist large structure in the Universe. The second alternative is that the models presented in this section support the present-day acceleration of the Universe as an explanation of the supernova observations. Within the type of models considered above it is impossible to fit the supernova data with realistic matter distribution (i.e. where variations of the density contrast are similar to what is observed in the local Universe). Currently, in terms of analyses of observations it seems that these two interpretations are equally probable. The difference is in the philosophical assumptions. The first interpretation requires that our position in the Universe is a special one. This, however, cannot be proved right or wrong by any current observations. The galaxy redshift surveys, like SDSS or 2dFGRS, measure galaxis up to redshift only z ≈ 0.4. On the other hand the CMB observation provide us with information about the state of the Universe which is currently about 14 Gpc remote from us. Because of flexibility of the Lemaître-Tolman model, models 4 and 5 can be fitted to the CMB data, simply by assuming that this Gpc-structure is compensated by outer regions and than the Universe is homogeneous. This implies the existance of very a large structure in the Universe, of diameters of order of Gpc. The second interpretation is based on the assumption that our position in the Universe is not special at all and on large scale the Universe is homogeneous. As mentioned above this assumption cannot be verified by observation, however there are some theoretical results that support this statement. These are the Ehler-Geren-Sachs (EGS)  theorem and 'almost EGS theorem'  which states that if anisotropies in the cosmic microwave background radiation are small for all observers then our Universe must be 'almost FLRW' on large scales. Therefore, it seems that the interpretation that the cosmological constant is of a non-zero value seems to be more probable. This section investigates the light propagation in the inhomogeneous universe with the cosmological constant. The value of the cosmological constant corresponds to the concordance value, ΩΛ = 0.73. Investigated models include model 7, 8, and 9. These models' density distribution is similar to the density distribution of models 1, 2, and 3 respectively. The results of fitting these models to supernova data are presented in Table 2. Results presented in Fig. 5 indicate that realistic matter fluctuations (as in the case with no Λ) introduce fluctuations to the residual Hubble diagram. These fluctuations are large for low redshifts but decrease fast for high redshifts. It can be seen from Table 2 that all models with fit the supernova data better. The residual Hubble diagram presented in Fig. 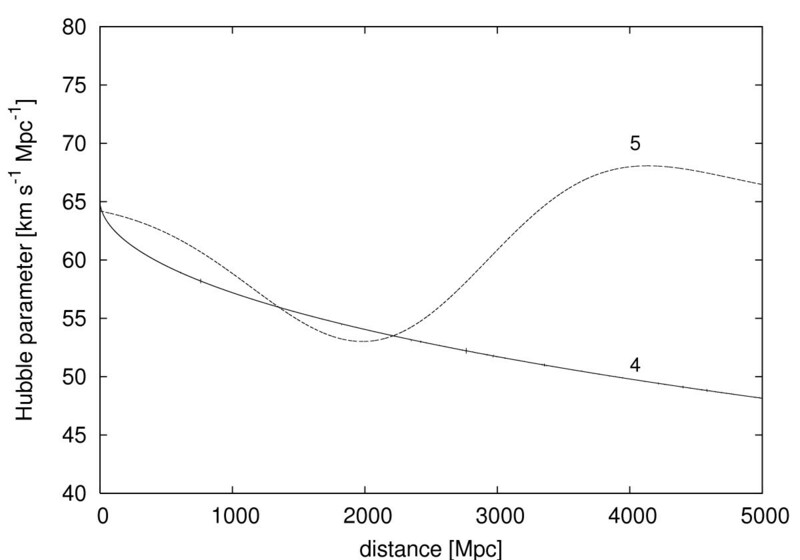 5 shows that the influence of the density fluctuations is significant only for small redshifts. It is uncertain whether this phenomenon is real or is just a consequence of the spherical symmetry assumption. Within a small distance from the origin, spherical symmetry is valid but as the distance increases it becomes less accurate. Fig. 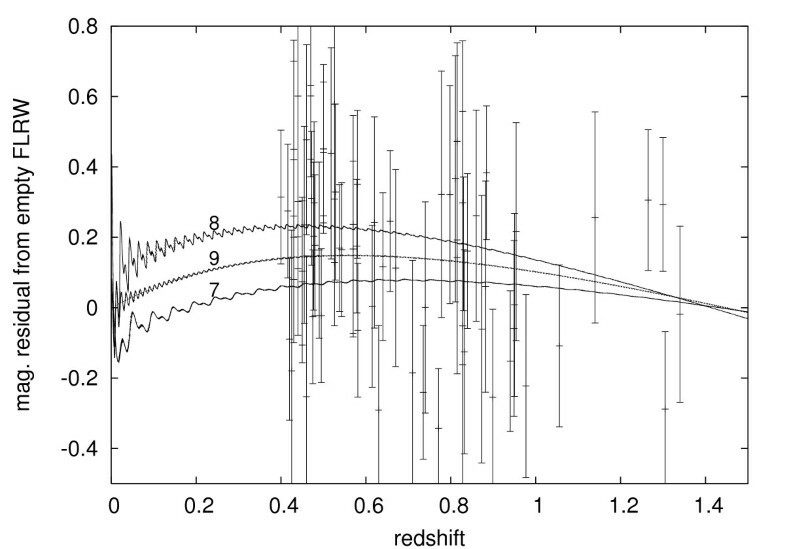 5 indicates that the amplitude of the fluctuations in the residual Hubble diagram is decreasing with redshift. This can be due to the evolution – in the past, the density fluctuations were of a smaller amplitude, hence the lower amplitude of fluctuations in the residual diagram. However, the Universe has not evolved significantly since the redshit z ≈ 0.5. so it might be possible that in non-symmetrical models the amplitude of the magnitude fluctuations would not decrease so fast as in our case. To confirm this hypothesis the above calculations should also be repeated in the inhomogeneous nonsymmetrical model. If it is confirmed it could partly explain the large scatter of the supernova data which is currently believed to be caused by numerous factors, like observational errors or non-uniform absolute brightness of the supernovae. This paper investigates the propagation of the light of supernovae in the inhomogeneous Lemaître-Tolman model. The inhomogeneous models are of great flexibility and can fit the data without invoking the cosmological constant, which has been proved by Mustapha, Hellaby and Ellis . Many authors before, like Célérier  or recently Alnes, Amarzguioui and Gron  have proved that the matter inhomogeneities in the Lemaître-Tolman model can mimic the cosmological constant and thus can be an alternative to dark energy. However, this paper indicates that the models which fit the supernova measurement without invoking the cosmological constant are very peculiar (see model 4 and 5, Sec. 4.1.2). These models have either a very peculiar expansion of the space (decreasing from the origin), or an unrealistic density distribution (increasing from the origin) or/and a very large amplitude of the bang time function (t B (r)). Introducing the Ockham's Razor principle, it is more likely that the Universe is accelerating rather than the conditions in our position in the Universe are so very special and extraordinary that they could be possibly responsible for the observed dimmining of the supernova brightness. 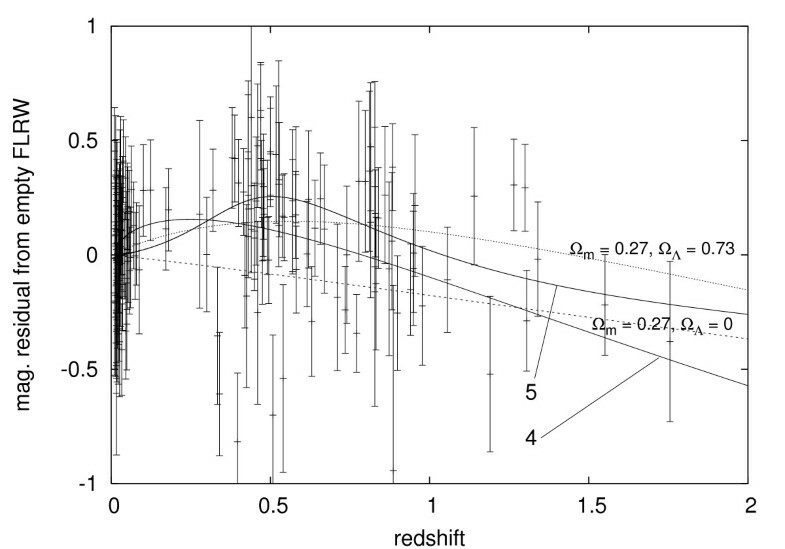 The results show that in the inhomogeneous Lemaître-Tolman model the amplitude of brightness fluctuations observed in the residual Hubble diagram is significantly large for low redshifts of amplitude around 0.15 mag but it decreases for higher redshifts. Thus, for redshifts larger than z ≈ 0.3 these fluctuations are neglgible. All this may be the result of the evolution (as in the past the density fluctuations were smaller, and, consequently were of smaller influence on the brightness fluctuations). However, it is also possible that this fast decrease can be due to the symmetry restrictions. The Lemaître-Tolman model assumes a spherical symmetry which puts too many constrains on the evolution and another parameters of the model. Therefore, it would be worth investigating the light propagation in the models which are both non-symmetrical and inhomogeneous. If in the inhomogeneous and non-symmetrical models the magnitude fluctuations do not decrease so fast, the observed scatter of supernova measurements might be partially possible to explain. The main conclusion of this paper is that matter inhomogeneities introduce the brightness fluctuations to the residual Hubble diagram of amplitude approximately 0.15 mag for low redshifts, and thus can mimic the acceleration on small scales. However, to explain the excess of faint supernovae without applying any special conditions (such as for instance peculiar expansion of the Universe) the cosmological constant has to be employed. Density distribution models 1, 2 and 3 (Sec. 4.1.1), and models 7, 8, 9 (Sec 4.2). Magnitude residual diagram for models 1, 2 and 3. For clarity supernova data (gold data set) from Ref. is only presented for redshifts larger than 0.4. The residual Hubble diagram for models 4 and 5. The Hubble parameter for models 4 and 5. Magnitude residual diagram for models 7, 8 and 9. For clarity reason supernovae data (gold data set) from Ref. are presented only for redshift larger than 0.4. The exact form of functions used to define models 1–9. Test χ2 of fitting the supernova observations. I am very grateful to Charles Hellaby for cooperation, helpful discusions, and hospitality. I would also like to thank Andrzej Krasiński, Bill Stoeger and Paulina Wojciechowska for their precious comments and help. I thank the Department of Mathematics of the Cape Town University, where most of this research was carried out and NRF of South Africa for financing my visit. This research has been partly supported by Polish Ministry of Science and Higher Education under grant N203 018 31/2873, allocated for the period 2006–2009. Polish Astroparticle Network is also gratefully acknowledge for financial support.